I served these shrimp burgers on toasted whole wheat buns with a shmear of Sriracha mayonnaise (just mix together a little mayo and Sriracha) and some lettuce leaves. If you're more into low-carb eating, just omit the bun. Or maybe substitute some tartar sauce, if that's how you roll. 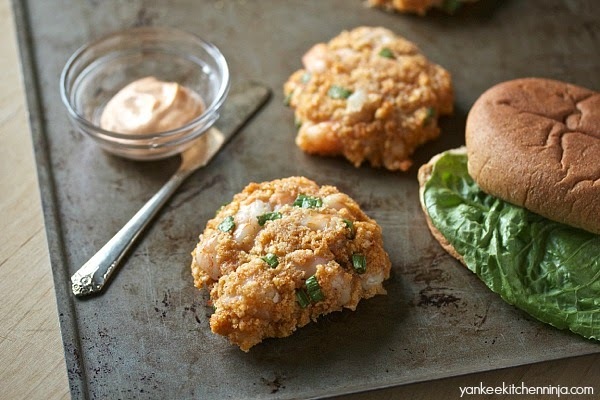 However you serve them, you're going to fall in love with shrimp burgers. Dudes: It's summer on a bun. Familiar with shrimp burgers? Been to the Big Oak? Just willing to give them a try? Leave a comment: The Ninj wants to know. Psst: If you want to make your shrimp burger a bit more Big Oak-ish, top it with some coleslaw and hot sauce. Combine all the ingredients in a large bowl and mix thoroughly. With moistened hands (it gets a bit sticky), form the mixture into 6 equal patties and place them on a parchment-lined baking sheet. Bake for about 10 minutes or until shrimp is cooked through. 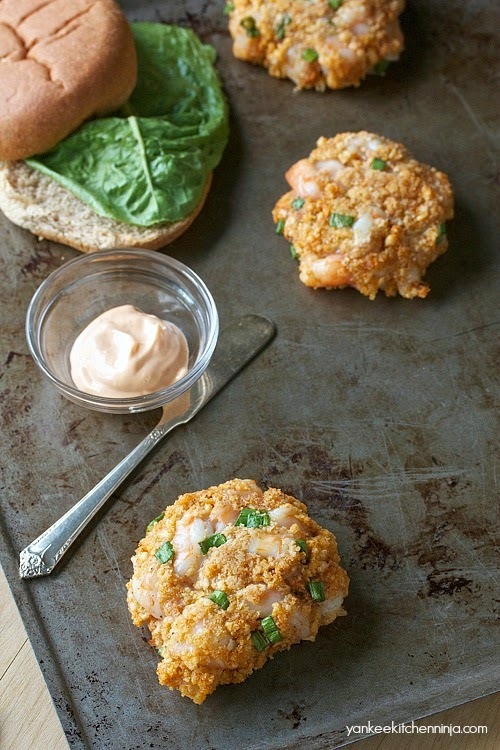 I've yet to make a shrimp burger, but yours look fantastic! Love that they are so crispy, even just baked! :) Perfect summer dish, if you ask me. They do seem to say "SUMMER!" 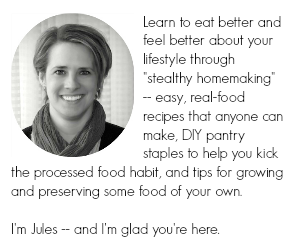 to me, too, Laura! 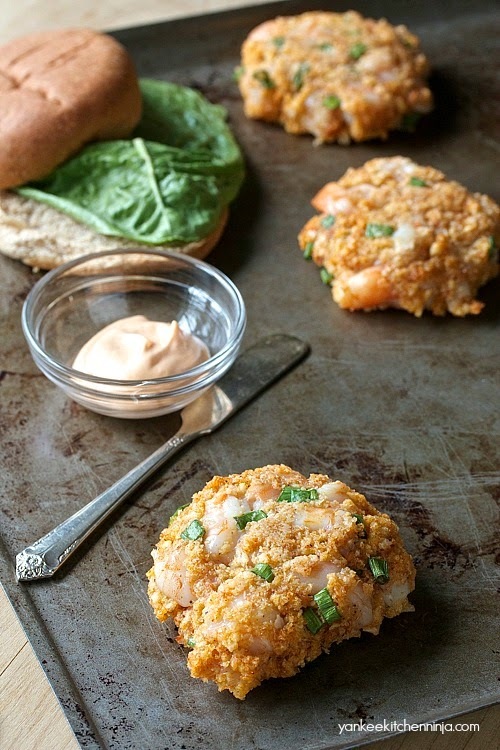 I love these shrimp burgers for several reasons. One, because I love shrimp. And two, because I am allergic to most shellfish, which is a travesty for a New England girl like me. But I am NOT allergic to shrimp. Go figure. Which means I won't get left out on this one. I seriously cannot wait to try this! So happy you're at least not allergic to shrimp, Allie -- enjoy!!!! I can't wait to try these, they sound fantastic. I'm always looking for something a bit different to make, and we have several shrimp eaters in our house who would love these. And they're super easy, too! Now you're talking, Ninj! This one is definitely going on my to-do list! Awesome post! Hope you love 'em, Bill! What do you suggest as a side? I was gonna try bun-less as well. What do you think? Franny, you can without a doubt go bunless, or turn them into a lettuce wrap. And I like baked sweet potato fries as a side with these. ENJOY! These were delicious! My daughter and hubby loved them as well! I baked about 20 minutes and used sriracha mayo sauce. Yummy!! !